Like many of his colleagues junior doctor Wiktor Szczudlinski is not happy with life in Poland at the moment, from pay (around £350 (€470, $690) a month) and workload (240-300 hours a month to make ends meet) to career prospects. So after finishing his general practitioner training he plans to spend six months working as a resident medical officer in a private hospital in the United Kingdom before taking his final exams. He then aims to get a permanent job in the UK or elsewhere in western Europe. “The number of Polish junior doctors intending to emigrate is increasing—and the earlier the better,” he says. Of course the money counts, but for me it isn’t paramount. First of all I am overworked. It is also frustrating and depressing. Szczudlinski is of course following a well trodden path. Since the widening of the European Union to 25 countries in 2004, large numbers of doctors from former Eastern bloc countries have sought to take advantage of the new freedom of movement within the community. The exodus has been particularly striking in Poland, where in the past three years an estimated 5000 doctors have left to work abroad. In some specialties, such as anaesthetics, doctors seem to be decamping en masse. In lower Silesia a quarter of all anaesthetists applied for certificates of “good standing”—prerequisites for working abroad—while one hospital had to cancel operations because all 10 of its anaesthetists had walked out in protest at low pay. Latest figures suggest that up to September 2007 a total of 1615 doctors from the Eastern bloc accession countries had registered with the Home Office to work in the UK, the largest proportion being hospital doctors (700), followed by medical researchers (315), consultants (215), anaesthetists (140), and general practitioners (115). Around two thirds of all those taking up health and medical posts came from Poland. The so called “brain drain” has led to an estimated shortage of around 4000 doctors in Poland and caused consternation in the health service. It has not been greeted with unalloyed enthusiasm in the UK either. Anyone from the European Union has the same rights to compete for posts at foundation year 1 and year 2 levels as UK applicants. So there is perhaps understandable concern that some east European doctors, rather than filling gaps in the service, could be taking jobs away from UK trained junior doctors or specialists. However, current figures do not bear that out. In this year’s specialty recruitment round 1 only 10% of all international applicants were from the European Economic Area (the EU plus Liechtenstein, Norway, and Iceland) and two thirds of them failed to make the grade. In total just 766 of the 13 500 posts went to European Economic Area nationals. Indeed there are signs that after the initial burst of frenetic activity, medical recruitment from accession countries like Poland may already be on the wane. Latest registration figures from the General Medical Council, for instance, show that in the last two years the number of international registrations dropped sharply from 9934 in 2005 to 6159 in 2006 and 5055 in 2007. 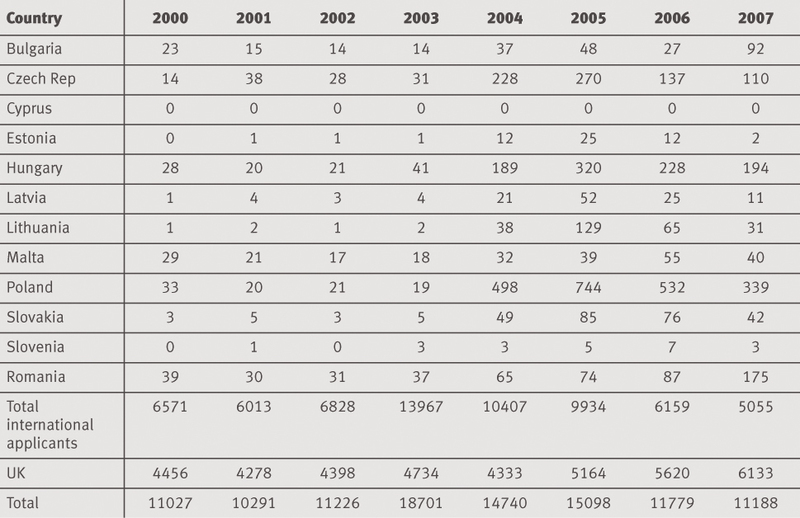 This was mirrored in a decline among accession countries from 1669 in 2005 to 1137 in 2006 and 772 in 2007 (see table⇓). Several recent developments, such as the introduction of work permits in March 2006, may help to explain the drop in overseas numbers, but the decline in European numbers is more puzzling. Polish registrations, for example, peaked in 2005 when 744 doctors registered with the GMC but dropped to 532 the following year and 339 last year. Similar declines have occurred right across Europe with the sole—and hardly surprising—exceptions of Bulgaria and Romania, both of which gained accession rights last year. Several health warnings come with these figures. GMC registration may be a prerequisite for working in the UK but it does not indicate how many people actually took up jobs. Nor do the figures reflect how many jobs an individual doctor has taken—or indeed when they started working. Nevertheless, the downturn in numbers seems to mirror the experience of several recruiting companies. IMS Recruitment, for instance, which specialises in recruiting medical staff from central Europe, has seen a noticeable cooling off after the explosion of interest in 2004-5. IMS Recruitment now focuses principally on finding doctors—often on short term contracts or in difficult to recruit specialties—for the private sector. And even here it is difficult to find a job for someone who hasn’t previously worked in the UK. “Most of the doctors we place in the UK now are ones we’ve already placed before,” he notes. There are some indications the love affair may have cooled on the Polish side as well. Ania Heasley, who runs the recruiting agency Ania’s Poland, knows of several Polish doctors who plan to return home because they have become disillusioned with the work in the UK. There is much debate about whether these doctors are here for the long term or just passing through. Probably even they don’t know at this stage. Sljivic suggests many doctors shuttle between short term jobs in the UK and spells back in their native countries, and Terry John, chairman of the BMA’s international committee, agrees. Others seem to be managing to bridge the divide by spending part of their week in Poland and part in the UK. Heasley says a number of Polish doctors fly in for weekend work in the UK while continuing to live in Poland. At the same time Poland’s own health service may appear more attractive to some of its doctors, ironically in part because of EU money that has become available since accession. In the past couple of years, for instance, the number of junior doctor training posts has risen and salaries have increased. The private sector is also beginning to re-establish itself. Interestingly, an important part of IMS Recruitment’s work now entails recruiting Polish and Czech doctors for the burgeoning private sector in their own countries. “A lot of doctors come to the UK and realise that it’s not the land of milk and honey,” explains Sljivic. “They miss their family and friends so they come back, to the private sector.” The fact they have UK experience and speak fluent English adds to their marketability. But other developments—such as the phasing in of the working time directive, which means demand for junior doctors will become even more intense—could all too easily trigger a second brain drain from less wealthy parts of the continent. After two years working as a GP in Greater Manchester Aleksandra Makojnik has no regrets about leaving her native Poland and no doubt she made the right decision. Aleksandra had a relatively well paid job as a GP running her own surgery in Poland but jumped at the chance of a job in the UK. The extra money was an important factor, but she was also frustrated because she couldn’t develop professionally in her own country. Doctors here are more valued than in Poland. “Here doctors are treated as the elite of society. In Poland the status of this group has been pauperised since the second world war.